Anxiety Help Online | Relief From Panic Attacks & Anxiety In Less Than 15 minutes-Guaranteed! Anxiety and anxiety panic attacks often disrupt your life and always seems to happen at the worse times, but don't think for one moment that you need to continue your life in this manner, with the suffering and struggling. Even children or college students experiencing stress from school can live very disruptive and hurtful lives, if the stress is not handled correctly and efficiently. Many professionals will hold sessions with you in their office to help you counteract your anxiety problems and anxiety panic attacks, but these sessions take so much time and energy away from your already busy schedule, plus you may not feel like these anxiety sessions are not really helping. Unfortunately, without trying other methods to help you with your anxiety problems, you, or your child, may simply be prescribed anxiety medications for the anxiety attacks, depression, panic attacks, or stress - but these medications come with harmful side effects that may be permanently debilitating to your health or body. These medications do not solve the problem, but instead are just 'bandages' that cover up the underlying problem. So what's the solution for anxiety issues? 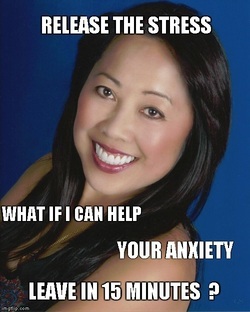 A 15 minute anxiety relief session with Vicki Mah - over the phone or Skype- can start the wheels to changing your life around, or your child's life around, to be free permanently from anxiety and stress - without having to use drugs. medications. Vicki Mah is dedicated & available to help you overcome life's hurdles. You will notice less anxiety, stress, depression or panic in 15 minutes or less and feel more calm and relaxed during and after your session. Get a 360 degree change in your life when you can live without anxiety or anxiety panic attacks. Learn from Vicki how to take charge of your life, have focus, and experience what true happiness in life really is. You won't need to spend time and gas travelling to your session because it can be done from your home over the phone or on Skype. Vicki Mah knows that your time and money is valuable to you and she respects that. Besides having such a tremendous success with her Release the Stress method for alleviating anxiety, depression, stress, and panic attacks, she is more than heppy to help you feel comfortable about your session and is backs it up with a money back guarantee. Get Started | Buy Now! Get Freedom In Your Life Now!